So, let’s go back to the initial reveal of Intel’s 28-core 5GHz CPU. During their Computex 2018 keynote, they showed this massive CPU running at 5 GHz on all 28 cores, and they managed to get it running a Cinebench multi-threaded workload that produced an appropriately huge score. People went crazy over this and headlines were generated everywhere, which is exactly what Intel intended, knowing full-well that AMD would be overshadowing them the next day with a 32-core Threadripper. When this news hit, we were quite suspicious about how exactly Intel managed to get this 28-core CPU running all cores at 5 GHz. It couldn’t be a consumer product, and not something that would ever be reaching the market, at least at the frequencies Intel was running it at on stage. Intel did say the CPU shown was a prototype and would be released in Q4, but I’ll get to that later. After Intel’s demonstration, various outlets like Paul's Hardware went over to the Gigabyte suite and exposed the Intel test system shown on stage. And low and behold, the CPU in question is cooled using a massive air conditioner unit that’s bringing the liquid cooling system’s temperatures down to sub-ambient levels. That’s red flag number one. Then you look at the motherboard they are using. It’s a massive enterprise-class board using the LGA3647 socket, which is normally used for Intel’s top-end Xeon processors. And at the top of the board is an outrageous 28-phase (or thereabouts) VRM solution with a huge heatsink and additional cooling, clearly capable of delivering massive amounts of power to this prototype CPU. That’s red flag number two. Now when you join the dots together it becomes obvious this is just an existing top-end Xeon processor (like the $10,000 28-core Xeon Platinum 8180), chucked into a board capable of extreme power delivery, attached to exotic cooling, then overclocked to the absolute maximum. Presumably this Xeon chip was also binned to a ridiculous degree such that a 5 GHz all-core overclock could be achieved. In fact, later on Intel would confirm to AnandTech that the demonstration was using an overclocked CPU and was intended as an overclocking demo… not that the company mentioned that on stage. Update: An Intel spokesperson reached out and provided this statement: "The 28C demo at the keynote is a real product in development targeted at the high end prosumer and enthusiast audience. 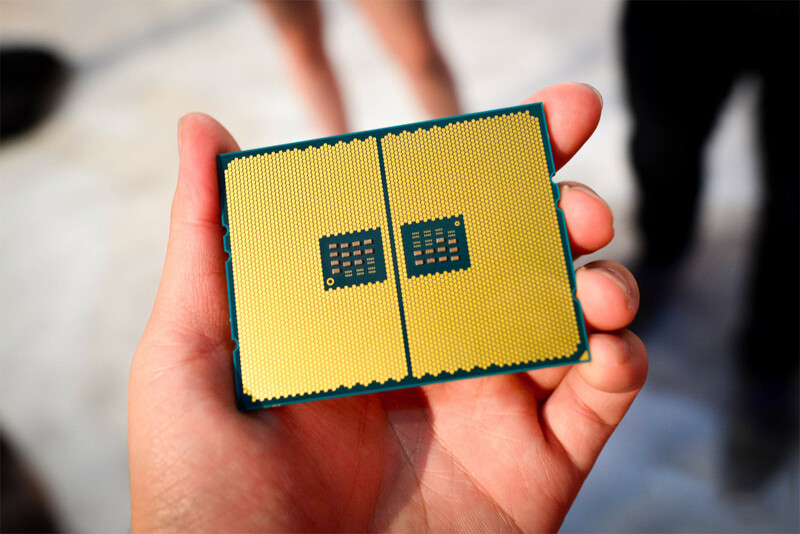 Intel continues to optimize design and process across its products, and the demo showcased an upcoming Intel product having the capability of 5.0 GHz overclocking across all 28 cores." Overclocking experiments using exotic cooling are awesome and something we see enthusiasts doing all the time, but it’s pretty disingenuous to say this CPU is coming to the market in Q4. There is absolutely no way we’re getting a 5 GHz 28-core CPU as either a desktop part or server part. Maybe we’ll get a 28-core CPU that hits 5 GHz as a single-core Turbo frequency, but 5 GHz all-core when the current flagship Xeon Platinum 8180 tops out at 3.2 GHz all-core? Yeah, that’s not happening. What Intel did at Computex is the equivalent of saying an i7-8700K is a 7 GHz CPU. Sure, it can hit 7 GHz as an overclocked part on extremely high-end motherboards with exotic cooling like LN2, but no consumer buying an 8700K is reaching 7 GHz in typical scenarios. They will be able to overclock it above Intel’s rated specifications, but not to the extremes possible with chillers bolted on to the CPU. This is in stark contrast to AMD’s announcement for Threadripper 2. Their 32-core CPU is a real product and it’s likely coming to market in August. It will be available for consumers, they will be able to put it in existing X399 boards, and they’ll be able to achieve the performance AMD showed on stage. AMD’s demo had the CPU clocked at a 3.0 GHz base and 3.4 GHz all-core boost, running on air cooling with the Wraith Ripper. That’s a reasonable configuration for enthusiast and workstation users of AMD’s Threadripper platform. The prototype 32-core CPU had a TDP of 250W, while Intel’s 5 GHz 28-core CPU could easily have been 500W or even 1 kW with the overclock they were using. It’s not even in the same ballpark: AMD’s Threadripper 2 launch was a reflection of reality; a real CPU with real specs that you will be able to purchase. Intel’s 5 GHz 28-core CPU showcase was pure fantasy. And basically, this is where things currently sit with Intel and AMD’s HEDT platforms. AMD had the capacity to push up to 32 cores with Threadripper 2 on the existing TR4 socket and X399 platform. After all, they already have 32-core Epyc CPUs on the market, so it wasn’t exactly difficult for them to bring that technology over to HEDT. They didn’t need to reinvent anything: they simply upped the number of active dies on Threadripper from 2 to 4 -- and boom -- there’s a 32-core consumer desktop CPU. AMD’s multi-die approach with the Infinity Fabric interconnect makes this jump from 16 to 32 cores straightforward; their development work on the Infinity Fabric is now bearing fruit, ripe for picking as incredibly high-performance desktop CPUs. On the other hand, Intel practically has their hands tied on the HEDT segment. Their top-end Core i9-7980XE pushes 18 cores on the X299 and LGA2011 platform, pushing that platform to the limits in terms of core count. Their server chips top out at just 28 cores on a single, massive die with low yields, on a completely different socket and platform, at prices exceeding $8,000. To compete with Threadripper 2, Intel would be forced to rip out the LGA3647 socket from their Xeon server line and shove it into high-end desktop motherboards. Then take their ultra-expensive Xeon 28-core chip and possibly push clocks even higher, all while remaining competitive on pricing. But will they do it? Or rather, do they have to? We were pleasantly surprised last year when Intel reacted to Ryzen by offering competitive processors across the board, and we’re very interested to see what Intel does with their HEDT line towards the end of this year. Whatever it is their “5 GHz 28-core” CPU actually becomes for consumers, we don’t expect it to come close to what they showcased at Computex. For now, it’s clear that Intel wanted to create a diversion and steal some of AMD’s thunder a day early, showing Cinebench numbers so ridiculous that Threadripper 2nd-gen didn’t look as menacing. But when time comes and only one of the two companies delivers the goods you can actually buy, then you’ll be able to vote with your wallet. We can’t say we liked the misleading demo, but hey, the CPU wars are back and that’s only great news for consumers.